One of Glenn Miller’s most lasting contributions to popular culture is “In the Mood”. It’s an instrumental jazz tune that most people will recognize, even if they don’t know the name… or even who the legendary trombonist and bandleader was. Although Miller arranged it and he and his orchestra produced the recording that made the tune a hit, Miller didn’t write it. Joe Garland and Andy Razaf are credited as writers, but they took the famous melody from a tune apparently written by Horace Henderson or Wingy Manone. “In the Mood” is one of the greatest hits of the Big Band era. It begins with a spritely sax solo joined by horns, one that fairly beckons listeners to get up and run to the dance floor, where it greets them with a lilting, easily danceable melody that gets mixed up just a bit with a couple solos, leading to a climax at the end. It’s well-named, providing the perfect atmosphere to get party-goers of the 1930s and early 1940s (and any jazz lover since) “in the mood” for dancing (and maybe more). The original melody dates to 1930 or earlier. 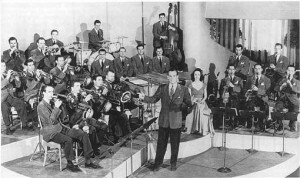 The Glenn Miller Orchestra’s classic recording of it was made in 1939, meaning it would’ve entered the public domain in 1996. Miller died in World War 2, crossing the British Channel on a mission to entertain Allied troops in France in late 1944. This entry was posted in 1930s, Music. Bookmark the permalink.